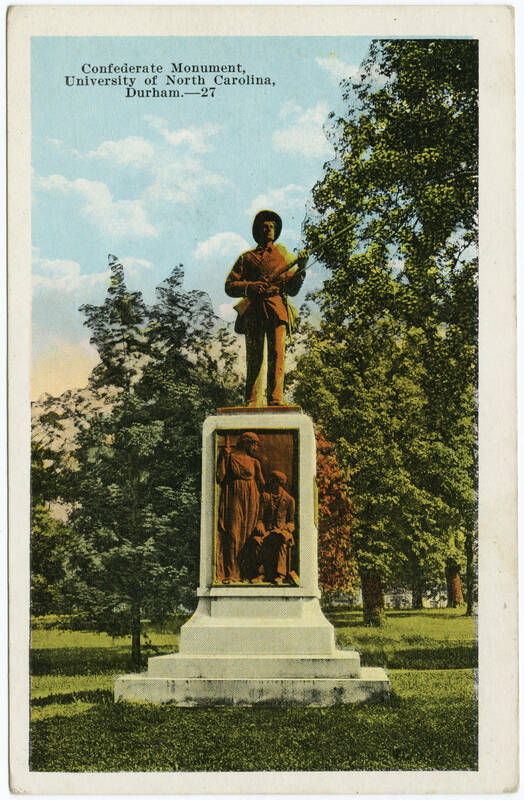 An undated postcard image of the UNC Confederate Monument. In 1908 Confederate Veteran reported that a “movement was inaugurated to erect a monument on the campus of the University at Chapel Hill to the boys who put aside their books and doffed uniforms, shouldered their guns, and went to the front in defense of a cause their fathers knew to be right.” That ambition to commemorate the University’s Confederate heritage placed Chapel Hill among many early 20th-century Southern communities memorializing the vanquished Confederacy. A thousand people eventually gathered in June, 1913 “under the oaks of the University campus” to dedicate the memorial to the University of North Carolina’s Confederate soldiers, one of 23 Confederate monuments dedicated in the US in 1913. That monument today known as “Silent Sam” was one of 185 monuments erected at the height of Confederate memorialization between 1909 and 1913 (compare the Southern Poverty Law Center’s inventory of Confederate monuments Google doc). The Chapel Hill dedication came a half century after Gettysburg, when Jim Crow segregation was firmly entrenched in the South and a spirit of White reconciliation characterized much of the spirit of public discourse between North and South. A month after the Chapel Hill ceremony, Confederate veterans (including several Chapel Hill speakers) would gather at Gettysburg with their former combatants in one of the most public statements of shifting regional sentiments and White reconciliation.